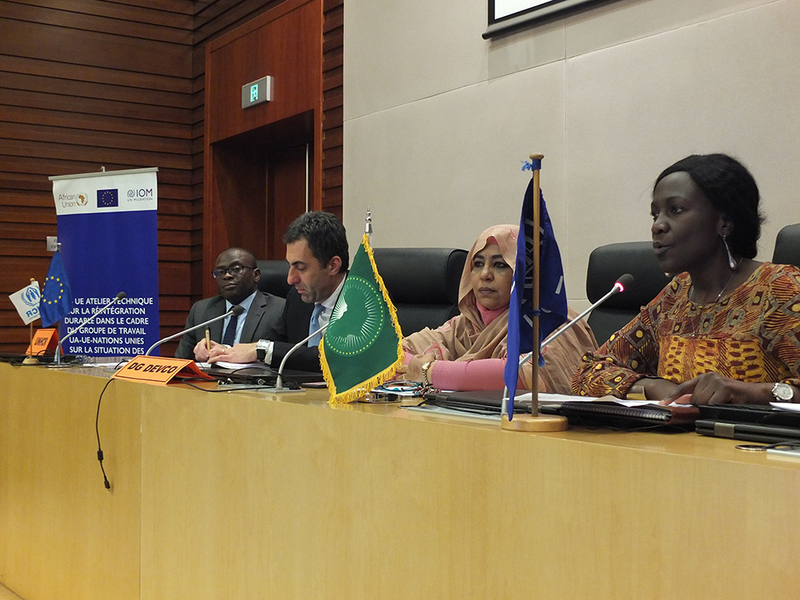 Addis Ababa – On 27 and 28 November 2018, the African Union and the European Union held a Technical Workshop on Sustainable Reintegration of Migrants in Addis Ababa, Ethiopia, with the support of IOM, the UN Migration Agency. As part of the work of the AU-EU-UN Taskforce on the Situation of Migrants in Libya, participants exchanged good practices, identified challenges and lessons learned, and looked at what more can be done to achieve sustainable reintegration of migrants returning to their home countries from various regions. European Commissioner for International Cooperation and Development, Neven Mimica, commented: "The EU’s migration agenda is comprehensive, balanced and broad. Our support for sustainable reintegration must be well-devised and meet returnees’ needs, so they can start afresh. Through the EU Trust Fund for Africa, the EU has invested EUR 345 million in the protection, return and reintegration of migrants in Africa, so that they can rejoin economic, social, cultural and political life at home. And these activities are producing results. So far, through the EU-IOM Joint Initiative, we have helped more than 55,000 migrants rebuild their lives." "Our focus must be on ensuring that returnees are sustainably reintegrated into their communities with both community-based approaches and sensitivity to individual specificities and needs,” noted Amira Elfadil, the Commissioner for Social Affairs of the African Union Commission. “From experience, I know this can only be sustainably achieved with all those involved in migration management. Reintegration is a complex and multidimensional policy issue affecting people’s lives. It requires structured cooperation among us all, so that we respect the dignity of refugees and migrants and protect their human rights, while respecting the sovereignty of the countries involved. Working for effective and sustainable reintegration requires cooperation and mutual understanding between countries of origin and destination." "While individual assistance already is a part of the reintegration landscape, this event is an opportunity to develop a technical dialogue and exchange about the more novel elements of practice at community and structural levels, ensuring a more comprehensive, integrated approach to sustainable reintegration," underlined Renate Held, Director of IOM’s Department of Migration Management. To respond to the rise in irregular migratory flows over the recent years, the EU, the UN and the AU have put in place concrete measures to assist people on the move, address underlying reasons for migration and assist migrants returning to their countries of origin. Sustainable reintegration is a key aspect of the migration process. If it is to succeed, it must be comprehensive, joined-up and needs-based. In this context the workshop brought together participants from AU and EU Member States, the UN, civil society and returnees to discuss the economic, social and psychosocial dimensions of reintegration, as well as the different levels of intervention – individual, community and structural – needed for the sustainable reintegration of migrants. The workshop’s outcomes will feed into the African Union’s future Return, Readmission and Reintegration Guidelines for Africa and the forthcoming IOM Reintegration Handbook, supported by the UK’s Department for International Development.